The first thing that struck me on flying into Guinea wasn’t so much the pervasive hand-washing stations or constant temperature-taking. 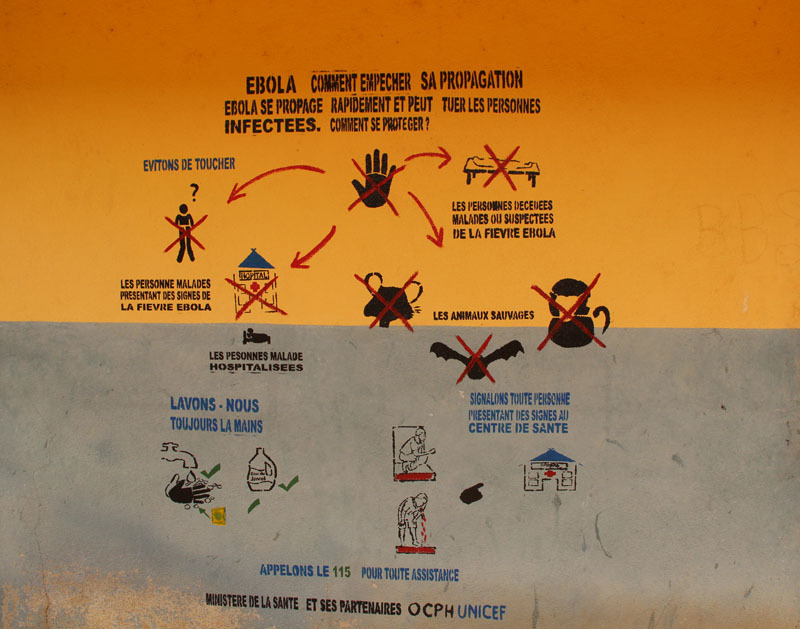 It wasn’t the giant billboards scattered throughout the city proclaiming “STOP EBOLA” in multiple languages. And it wasn’t even the daily email updates from the World Health Organization reminding me of the rising death toll. Having lived in West Africa for more than seven years, it was the blatant lack of physical greetings that really unnerved me. Gone were the days of vigorously shaking the hand of even the most remote of strangers. Gone were the days of complicated, seemingly “secret” handshakes shared among even the best of friends. In their place now were awkward bows, with hands placed in a praying-like gesture at the chest. I saw a few salutes to the brow. Some nods of the head. Every now and then, a fist pump that stopped just short of touching the other person’s hand. But people always kept their distance. 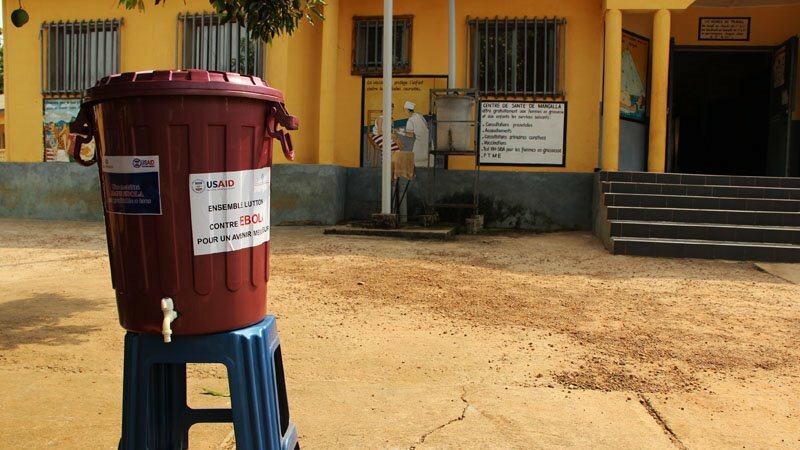 No cases of Ebola have been reported in Gueckedou, which borders both Sierra Leone and Liberia, since the beginning of the year, but it was clear that everyone still took the utmost precautions. Myself included. From the moment I stepped off the plane, I suddenly became hyperaware of everyone and everything. Did that cough or that sniffle mean the person was contagious? Was I far enough away from someone should a drop of saliva fly from their mouth while talking? Can I eat the grilled street peanuts that a woman scoops into small plastic bags with her bare hands? Probably. But nothing was certain. It was exhausting. It was isolating. It was, quite frankly, bizarre. And yet, as we travelled from village to village, life appeared to continue as usual. People went to the market, washed their clothes, and attended school and work. Children played, laughed. 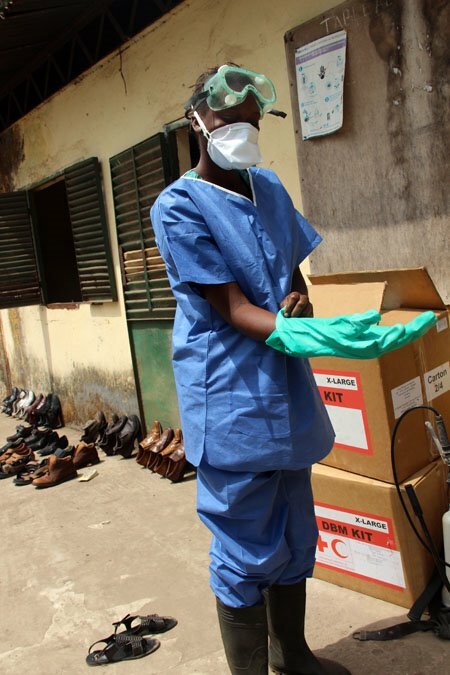 But behind every action was the constant reminder that more than 3,500 people had fallen sick with Ebola in Guinea and 2,400 had died. I landed in Guinea’s capital, Conakry, on a Wednesday evening, after a delayed, but short, flight from my home base in Dakar. I spent a surreal evening at a “fancy” hotel, talking with both locals and aid workers about the current Ebola situation. The next morning I began the long trek to Gueckedou, in the southeast of the country, along with a travel partner from UNICEF. 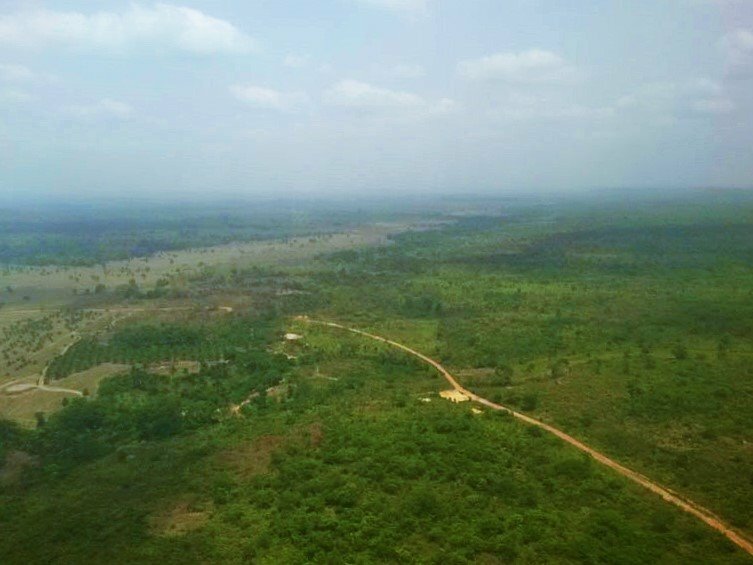 I lucked out – as a journalist, I was able to catch a helicopter ride on a UN-sponsored flight. It’s a bumpy, noisy, two-hour journey – albeit one with beautiful views of the lush, green landscape – but a much better option than the two-day drive over rough roads that most people must make. We landed in Kissidougou – an “airport” by name, but not much more than a dirt landing strip and small restaurant attached to a waiting room, which recently reopened to accommodate aid workers. After a “cold” bottle of water and a bite of lunch, we hopped into a pickup truck and continued on the journey to Gueckedou. It was another two-and-a-half-hour ride over some of the roughest roads I’ve ever traveled. My insides rattled. It was near impossible to take a sip from my Nalgene flask without splashing water on my lap. Once in Gueckedou, we settled into the hotel. But the travels weren’t over yet. The next few days would involve driving up to three hours each way, further into the forest to visit some of the more remote villages. It’s easy to see how health workers and aid agencies had trouble reaching some of these places. Even with a local guide, it’s hard to know which way to go at each of the countless forks in the roads. A lot of villages aren’t visible from the main road and many aren’t accessible by vehicle. We stopped often to ask if we were on the right path. People pointed forward, their faces clearly wondering why we were headed to such a place – even though they must have known it was because of Ebola. After more than a year of reporting from afar on community resistance and attacks on Ebola health workers, I had expected, as a “buuri”, or foreigner, at the very least not to feel quite welcome. Perhaps even experience outright hatred or suspicion. Not to mention the prospect of the blatant denial of Ebola, which had contributed for so long to the spread of the disease. But most people I talked to in Gueckedou accepted the virus as real. Everyone I met was kind and generous. It wasn’t until my second-to-last day, back in Conakry, while attempting to witness a “safe and dignified” burial, that I experienced any backlash. I was traveling with a team from the International Federation of Red Cross and Red Crescent Societies, trying to follow a local Red Cross burial team. But upon arrival at the cemetery, after having been (purposely?) misdirected a number of times by locals, it was clear our (my?) presence was not wanted. Strike one: I was a woman, trying to observe what is normally a male-attended Muslim ceremony. Strike two: it was assumed, as a journalist, I had a camera. And (perhaps) strike three: I was traveling in a Red Cross car, which many people still remain suspicious of. Minor confrontations ensued. I retreated up a hill to the safety of our car. Ultimately, we were chased away. I never got to see much more than a glimpse of the shrouded corpse being moved from the mosque to a nearby burial plot in the back of a pickup truck. From afar, I briefly caught sight of the yellow protective-gear outfits and bright green-blue gloves worn by the burial team members. The journalist in me was disappointed, angry and frustrated at not having been able to get the story. But, in all honesty, it was also a bit of a relief. The rational side of me knew the body had already been disinfected, that it no longer posed a threat. But there was also a small part of me that feared getting too close, putting myself in too much danger. I had spent the past week (year, really) talking with health workers, survivors, orphans and widows. I knew that Ebola did not discriminate against anyone or anything. I knew the death and destruction and hurt the virus caused. I did not want to become the next statistic. I wanted to live to tell at least some of the stories from Guinea, in the place that it all began. A feverish night on my return to Senegal gave me (and my IRIN colleagues) a bit of a scare but thankfully it turned out to be a short-lived false alarm. Despite never truly believing it could actually be Ebola, there was still that lingering doubt and momentary, but intense, feeling of panic. I replayed the trip over and over in my head. I looked back through my journal, my interview notes and my photos, trying to see if there was any moment, any instant at all, that I could have unknowingly put myself in danger. It didn’t seem possible. In the end, it turned out not to be possible. I wish I could say the same for so many others who faced a much different fate.